BRASSERIE PERSIL'S success story began in 2003, when Julio Velasquez and Peter Oktas met at Bistro Cassis in Huntington; Mr. Velasquez was executive chef, Mr. Oktas a waiter. Mr. Velasquez went on to manage two other restaurants with the same ownership: Bistro Citron in Roslyn and Mac's Steakhouse in Huntington. Soups were topnotch. The French onion soup on the menu had rich beefy flavor and was not overly salty, as it sometimes can be. Two soups du jour also hit all the right notes: a creamy lobster bisque with chunks of shellfish and croutons; and a rich mushroom velouté crowned with a tiny goat-cheese cream puff. Salads were good starters, too. The octopus salad had tender nubbins of seafood tossed with baby arugula, cucumber, red onion and tomato. The creamy lobster bisque with chunks of shellfish and croutons; and a rich mushroom velouté crowned with a tiny goat-cheese cream puff. Julio Velasquez came to this country from El Salvador; Peter Oktas emigrated from Turkey. 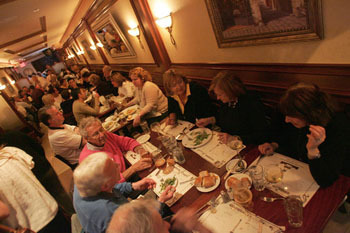 Two years ago, the multinational team opened Sage Bistro, a French dining spot in Bellmore. Now, they've launched a second place in Oceanside, Brasserie Persil. As executive chef, Velasquez works with chef de cuisine Jose Velasquez (no relation) to turn out a roster of Gallic (and not-so-Gallic) dishes with élan and efficiency - no small feat, considering the crowds that pack the place nightly. Entering from the rear parking lot, I survey the attractive space, much of it a corridor that widens in the front. The decor is pretty but somewhat generic. Still, the bar looks vaguely French; the mirrors have menu items scrawled upon them, a bit of bistro style. The moment I'm seated, slices of baguette are placed on my bread dish; water glasses are filled. Alongside a triangle of plain butter is a little green butter-herb blend made with tarragon, sage, rosemary and the restaurant's namesake parsley. I ask whether we can get a half order of the ravioli of the day as an appetizer. Mais oui, our decidely not Parisian waiter says. The al dente pasta pouches are filled with soft shreds of beef; the sauce is a rosemary-infused beef jus, almost a broth. Is the dish French or Italian? What matters is that it's delectable. I relish the smokiness of grilled octopus served over a toss of baby arugula, roasted peppers and chick peas. Plump mussels Provençale are bathed in a lively tomato, basil and garlic sauce. One night, the risotto du jour is made with scallops, which are neatly seared and placed atop a creamy Arborio rice mixture laced with chopped scallops, asparagus, peas and fennel, a provocative contrast of tastes and textures. It comes as a pleasant surprise that the steak au poivre, ordered rare, arrives exactly that. It's also tender and juicy, drizzled with a green peppercorn sauce and served with haricots verts and a sumptuous little potato gratin. Velasquez does skillful work with a steak-like duck breast and rich leg confit served with roasted butternut squash, leeks and a morel mushroom sauce. But the crisp-skinned snapper filet in a Mediterranean olive and basil sauce is dry inside, the accompanying salad of tomato and white beans way more interesting. Outclassing that is an inspired fricassee of monk fish and lobster, plated over parsley spaetzle and asparagus in a fragrant brandy-lobster broth. A flavorsome "seared" pork chop paillard turns out to be coated with bread crumbs and fried. But it's perfectly fried, crisp outside, moist within, topped with a cool Waldorf salad and garnished with caramelized onions. I like the hanger steak sandwich, roseate slices on a fresh baguette served with ideally crisp, thin, piping hot French fries. Too bad they cool off so quickly. Dinner concludes with tender crepes Suzettes in orange sauce; there is no flambéing at the table. A puff pastry lemon tart is nice and warm, a fruit-topped mascarpone tart better still. My favorite is the dark chocolate mousse crowned with freshly whipped cream. It's intense and bittersweet, like a night spent in Paris. Reviewed by Joan Reminick, 5/13/08. Lunch, Tuesday to Saturday, noon to 3 p.m.; Dinner, Tuesday to Thursday, 5 to 10 p.m., Friday and Saturday, 5 to 11 p.m., Sunday, 4 to 9 p.m. Chef and co-owner Julio Velasquez, born in Salvador, presides over a mostly French kitchen with the proficiency of a native Parisian. Say oui to the smoky grilled octopus, plump mussels Provençale, steak au poivre and dark chocolate mousse.